Many residences in Southern California struggle with drought conditions and water restrictions. 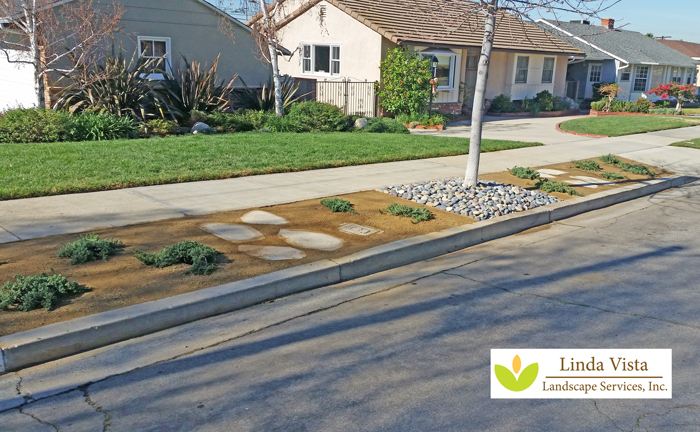 This Burbank, California resident wanted to remove the traditional parkway grass and re-landscape with a drought tolerant parkway. The grass was removed down to past the roots to prevent regrowth. Drip irrigation was installed and connected to a timer for carefree maintenance. Dwarf Junipers were planted. These low-to-the-ground evergreen junipers stay close to the ground, spread out a bit, and are easy to maintain. The new design did not remove the tree. Instead it was incorporated into the beautiful new parkway with river rock and a treated wood border. Finally, decomposed granite was installed, along with flagstone steps. A very clean, easy landscape that is also mindful of water conservation.